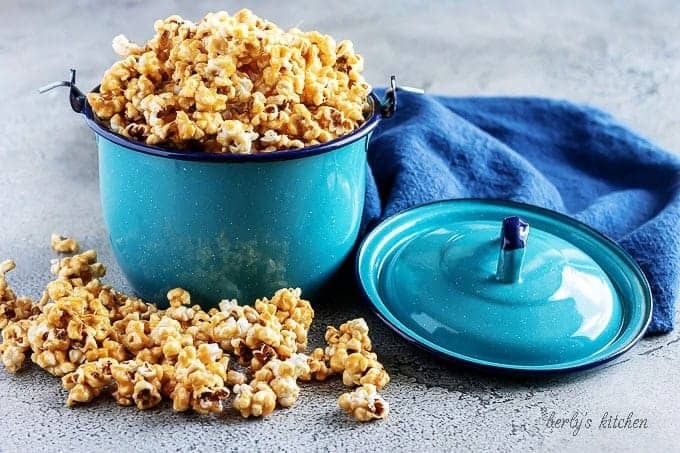 Our caramel corn popcorn is the prefect recipe to satisfy your craving for a salty, sweet snack. Be sure to give it a try and see how tasty popcorn can be! Kim and I are trying to get into the Halloween spirit this year. It’s tough for both of us, because we really don’t enjoy the holiday. Neither one of us likes scary movies or loads of candy. So, for Kim and I, Halloween is a day that usually gets ignored in our home. When our son was little, we took him to festivals and trick-or-treating, but that was about it. 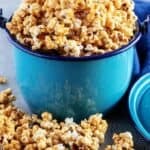 Now that we own a food blog, we decided that we should at least give it an honest effort, hence our caramel corn popcorn recipe. If you read my last post, then you know we don’t go for “gross-out,” food. Keeping that in mind, Kim wanted to share a dish that honors the flavors of this scary holiday season, without all the fake blood and plastic spiders. The result, a candy coated popcorn that’s both salty and sweet. I think you’ll like it and if you keep reading below, I’m going to toss in a few tips at the end to add even more flavor to this awesome snack-themed recipe. First, start by making the popcorn. Kim used the stove-top method with a little vegetable oil and whole kernels. Feel free to use an air popper to cut down on the fat in the dish. Once the popcorn is cooked, transfer it to a large mixing bowl and set it aside. Next, preheat your oven to 250 degrees F. and grab a medium saucepan from your cabinet. Heating the pan over medium heat, melt the butter. After that, add the brown sugar and corn syrup to the melted butter. Stir everything together and bring the mixture to a boil. Allow the candy to boil for 5-minutes without stirring it any further. Then, remove the caramel base from the heat and mix in the baking soda, sea salt, and vanilla extract. 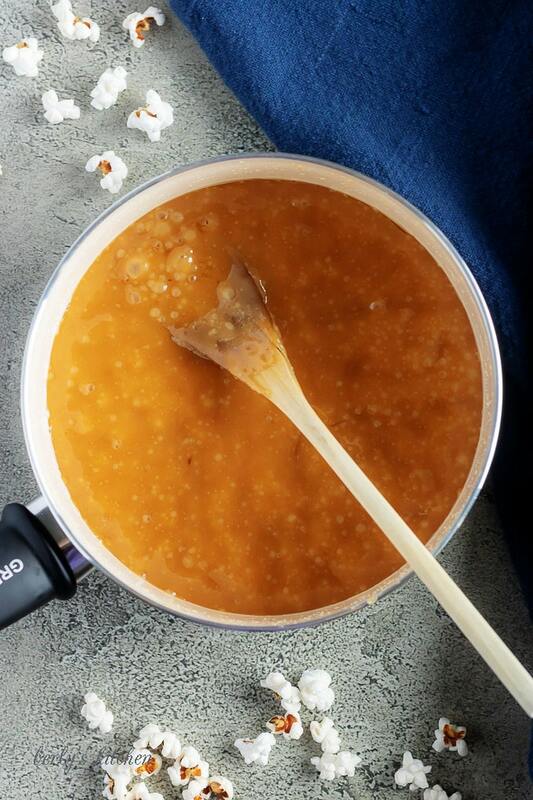 Go head and stir it all together to create a tasty caramel sauce. Now, pour the hot caramel over the popcorn and use a spoon to gently stir the caramel corn. Afterward, transfer the candy coated popcorn on to 2-foil lined baking sheets sprayed with non-stick cooking spray or a lightly greased roasting pan. 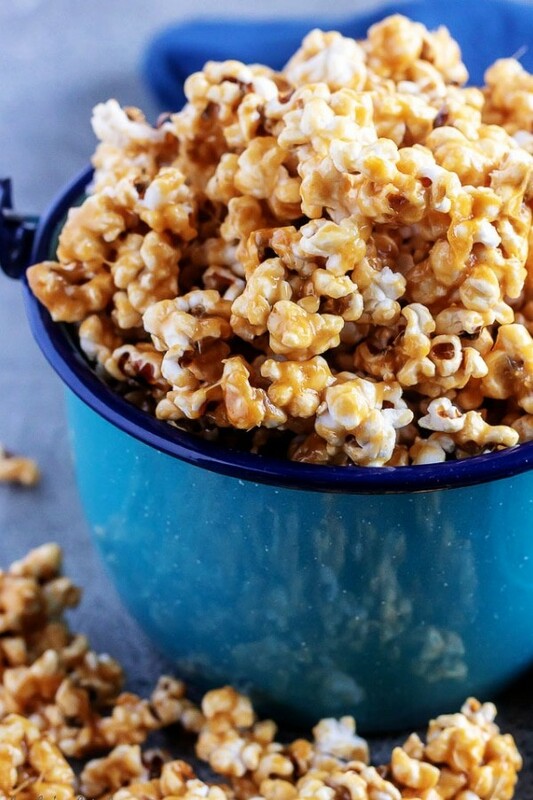 Bake the caramel corn for 30-minutes, flipping the mixture every 10-minutes. Last, remove the caramel corn from the oven, spread it out over wax paper and let it come to room temperature. You can break up any large clumps before serving. 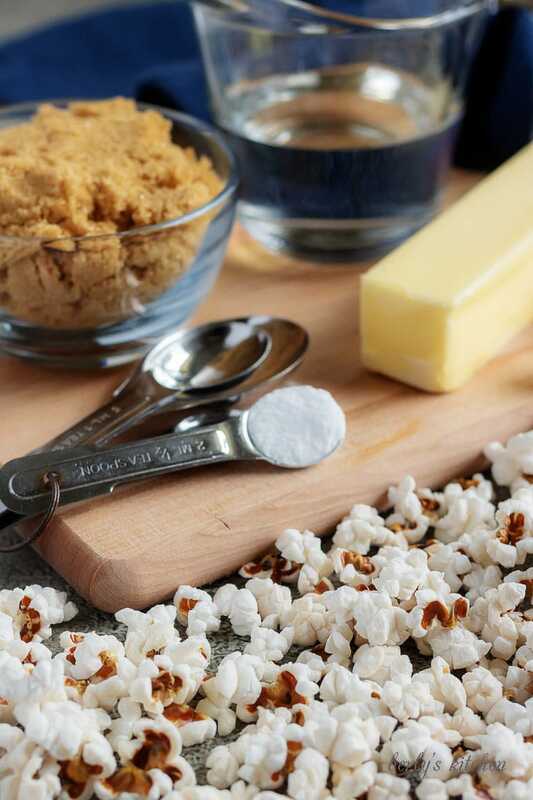 Once the caramel corn popcorn has cooled, drizzle it with melted milk or white chocolate to add another layer of flavor. Also, you could add almond pieces or peanuts to the caramel before tossing it with the popcorn for even more deliciousness! Go to your nearest arts and crafts store and pick festive baggies and portion out the popcorn into the bags for a Halloween party. 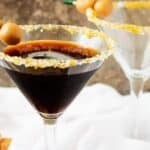 Here are a couple of other snack-themed recipes for you to take a look at: Halloween Snack Mix or Peppermint Bark Recipe. First, start by making the popcorn. You can use the stove-top method or an air popper. Once the popcorn is cooked, transfer it to a large mixing bowl. Next, preheat your oven to 250 degrees F. and grab a medium saucepan. Melt the butter over medium heat. After that, add the brown sugar and corn syrup. Mix everything together and bring the mixture to a boil. Allow the candy to boil for 5-minutes without stirring. Then, remove the pan from the heat and mix in the baking soda, sea salt, and vanilla extract. Mix well. Now, pour the hot caramel over the popcorn and gently stir the caramel corn. Transfer the popcorn to two foil-lined baking sheets sprayed with non-stick cooking spray. 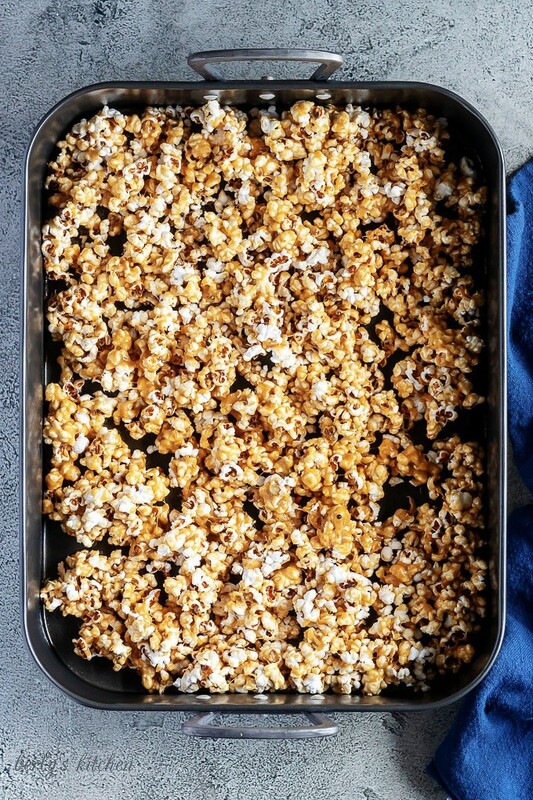 Bake the caramel corn for 30-minutes, flipping the mixture every 10-minutes. Last, remove the caramel corn from the oven, spread it out over wax paper and let it come to room temperature. Break up any large clumps before serving. The calories listed are an approximation based on the ingredients and a 1/2-cup serving size. Actual calories will vary. 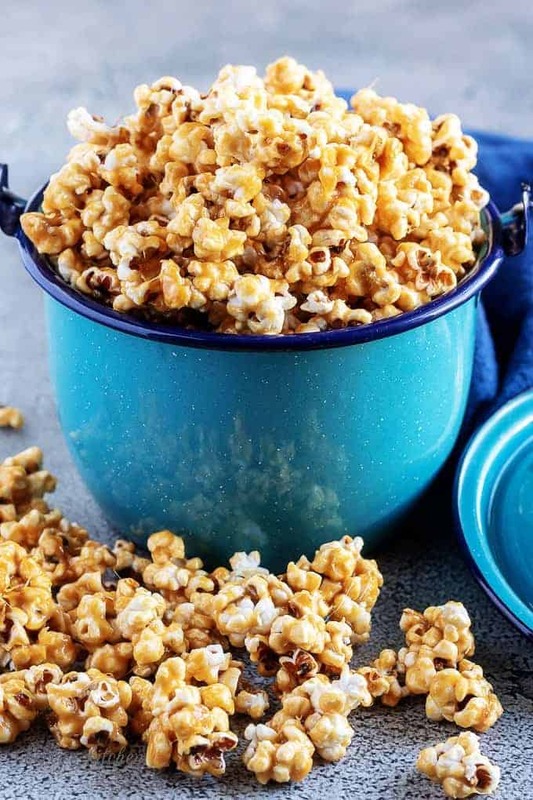 The caramel corn popcorn can be stored in a sealed container on your counter for up to 3-days.